Rediff.com » News » VOTE! Who is the hottest male politician? Thousands of readers participated in our poll to select the hottest woman politician, in which Canadian MP Ruby Dhalla emerged as the winner. For our poll on the hottest men politicians, we scouted across Asia, Europe, the Americas and Africa, and found that some of the most powerful leaders on earth today are also mighty pleasing to look at! 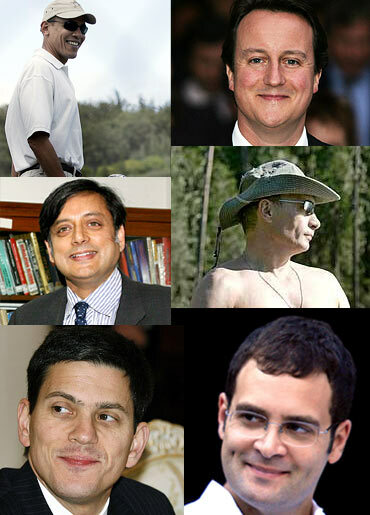 Rediff.com brings you some politicians who have managed to make politics more interesting by simply being so darn cute. Who is the hottest male politician? 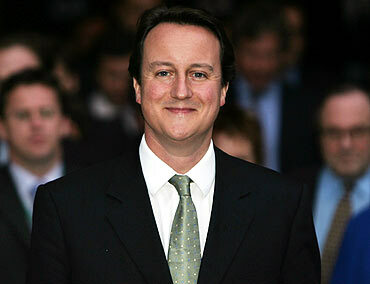 That the most powerful man on earth is also one of its best looking leaders is a foregone conclusion. Women across the world continue to swoon over the US President's irresistible looks, complemented by his trademark wide grin. During his presidential campaign, Obama was described as being 'ridiculously good looking' by a section of the media. A journalist once famously asked him if being 'too attractive' would hamper his prospects. Even George W Bush found Obama to be a "bright, clean and nice-looking guy". And who can argue with that? The former British foreign secretary has a Facebook page dedicated to his 'hotness', and another one advocating that the gorgeous Labour Party leader and MP be made the prime minister of Britain, and fast! 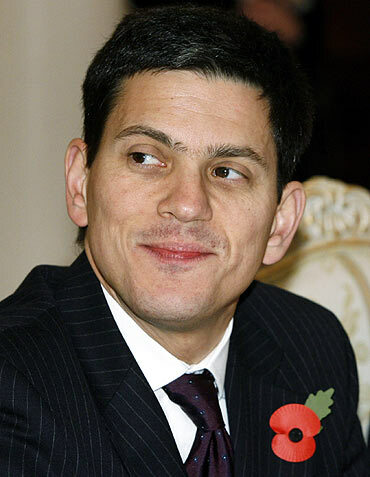 It has often been alleged that Miliband's striking looks, not necessarily his political skills, are the reason behind his popularity. In an interview, United States Secretary of State Hillary Clinton admitted that she had a 'big crush' on the politician. "He is so vibrant, vital, attractive, smart," the otherwise politically correct leader had gushed. The British Prime Minister was featured among the 'sexiest men in the world' in a poll conducted by a women's magazine, and managed to beat actor Russel Crowe and singer James Blunt. Before he became one of the most powerful men in the world, the most common adjective used by the media to describe Cameron was 'dashing'. The premier of a country famous for its 'stiff upper-lip attitude' is surprisingly very popular among gay communities across the world. The former United Nations diplomat used to be one of the most awaited attractions (for the women and probably some men!) at high-profile Indian American bashes in New York City. The handsome Member of Parliament has a way with words, and women of course! 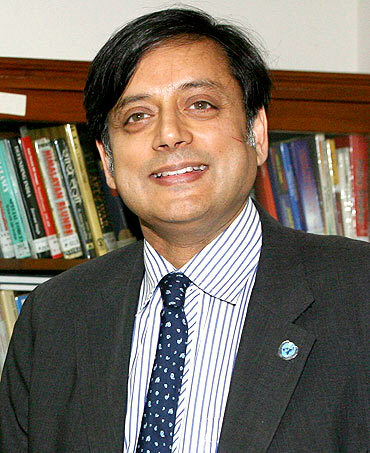 A subject of endless gossip during his heyday in NYC, the former minister tied the knot for the third time with Sunanda Pushkar on August 22. He might have little to say, but boy is he good to look at! No list of best looking politicians is complete without the Gandhi scion. 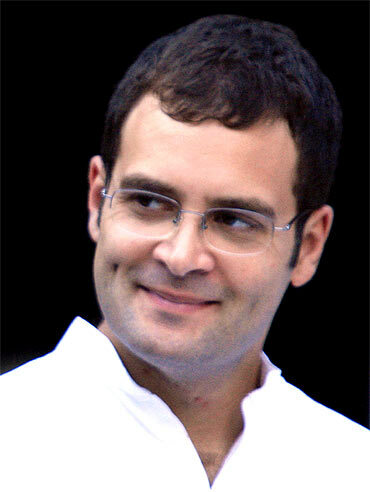 It is not known if Rahul has inherited the political acumen of Sonia and Rajiv Gandhi, but he sure has managed to combine the best features of his good looking parents. Gandhi's presence recently caused a near-stampede like situation at a Patna college, as hundreds of young female students scrambled to get up, close and personal to the SPG-protected leader. 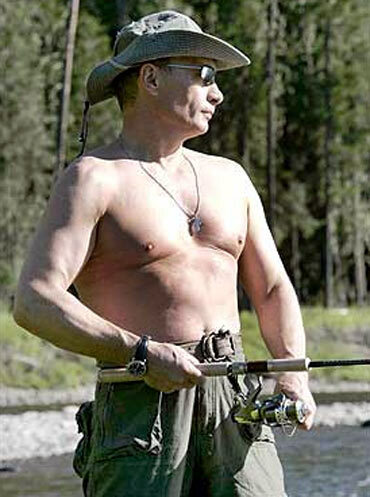 The 58-year-old Russian prime minister is not shy about removing his shirt in front of hundreds of cameras, like he did during a fishing expedition with Prince Albert of Monaco in the Siberian mountains, in 2008. Putin is a black belt in judo and he attributes his fitness to sports activities. He has always maintained an image of machismo. Putin has been shown on television driving a truck, on a submarine, co-piloting a fighter jet, and running a train. 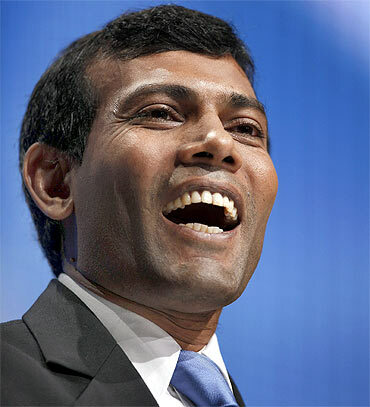 Nasheed heads one of the tiniest nations in the world, but has been hailed by the United Nations as one of the most environmentally conscious leaders. He has been tirelessly seeking a climate change deal to save his nation, which faces extinction due to rising sea levels. He was dubbed 'Prince Charming' by the media in Thailand during his visit to the country in 2006, due to his tremendous popularity among women. 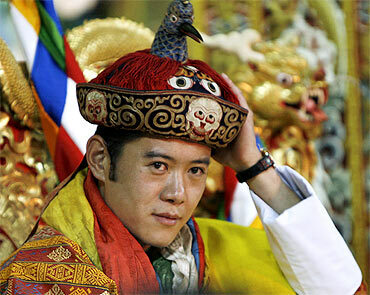 Always dressed in traditional attire, the mild mannered and very cute Bhutan prince is equally popular in his country for his attempts at ushering in democracy peacefully. With Prince Wangchuck at the helm, no wonder Bhutan flaunts its concept of gross national happiness. 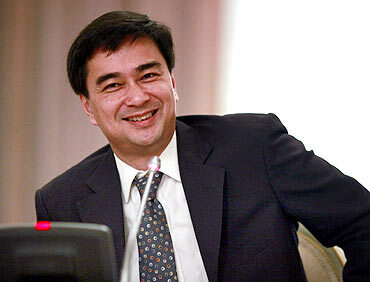 The Oxford University graduate has been the Thailand premier through extremely turbulent times. Since taking over the PM's post in December 2008, he has weathered the global economic crisis, the violent protests in Bangkok and allegations of massive corruption. But a recent survey showed that Vejjajiva remains a very popular leader with high approval ratings. One look at their very cute leader probably makes the people of Thailand forgive his alleged transgressions. 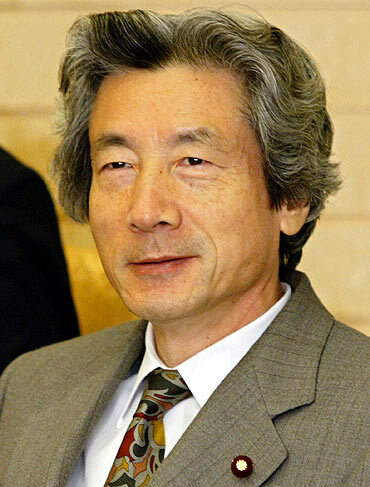 In a nation known for its somber and drably dressed politicians, Koizumi struck a different note with his trademark flowing grey locks and maverick personality. The former Japanese prime minister was also known for his ardent fervour for Elvis Presly. He famously sung 'I want you, I need you, I love you' with Hollywood actor Tom Cruise during the latter's visit to Tokyo. But he angered many when he decided to send Japanese troops to support the United States' troops. He also sparked a diplomatic row with China when he visited the Yasukuni Shrine, which contains the graves of many convicted war criminals. 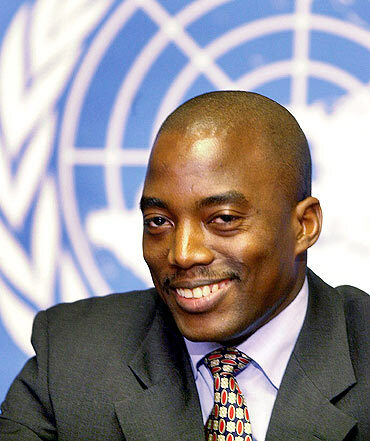 In 2001, Joseph Kabila became the President of Congo at the extremely young age of 29. He has had the unenviable task of managing one of Africa's largest and most war-ravaged nations for the last nine years. Kabila is notoriously shy and rarely agrees to give interviews. But the soft-spoken leader has a frightening tougher side. He has received military training from a defence academy in China and once reportedly commanded an army of child soldiers. As the President of Bulgaria since 2001, Parvanov has tried to mould the former Communist nation to his socialist ideals. Parvanov, a historian by profession before he joined politics, is also fond of jogging and football. The Georgian president is known for his temperamental nature and his frequent spats with Russia. 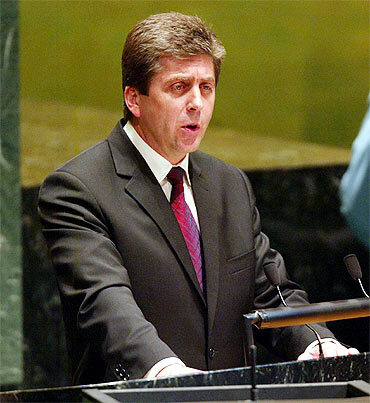 He is a polyglot and speaks Georgian, English, French, Russian, Ukrainian and Spanish. 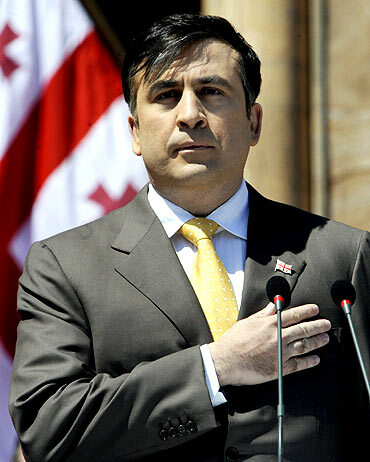 Saakashvili has remained unaffected by global criticism about the poor human rights record and curtails on press freedom during his regime. Hollywood actor Andy Garcia will play the good looking politician in a movie set to release later this year. Bilawal was left red faced recently when certain photographs of him, partying with a bunch of girls, were posted on a social networking site. 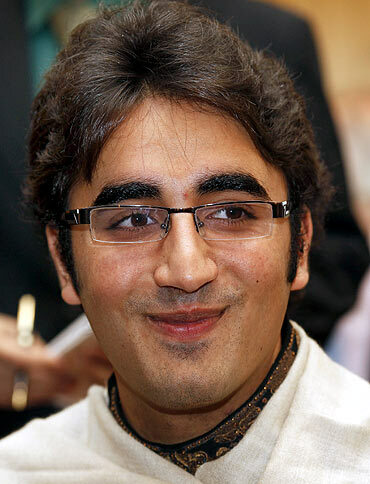 It was later claimed that the photographs were posted by pranksters impersonating Bilawal. Though he is technically the president of the ruling party of Pakistan, 22-year-old Bhutto has little experience in active politics. Bhutto has just completed his graduation from Oxford University. He is expected to be formally launched into the troubled country's politics by his father, Pakistan President Asif Ali Zardari. He is considered to be one of Europe's best dressed politicians. 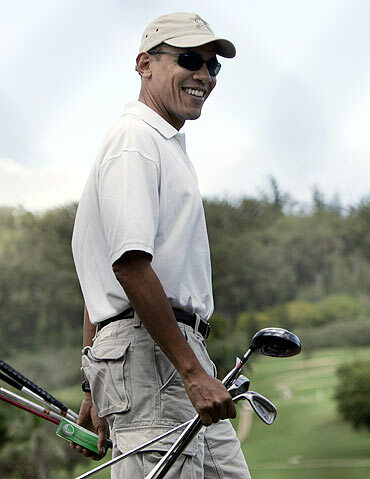 Ozdemir is often compared to Barack Obama, who became the US President despite his race and a mixed cultural heritage. 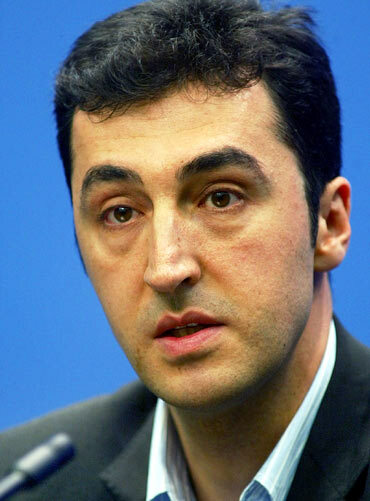 Ozdemir, who hails from an ethnic Turkish Muslim family, is the chief of Germany's Green Party. He was the first ethnic Turk to be elected to Germany's parliament Bundestag in 1994 and to the European Parliament in 2004. Vote: Who is the hottest male politician? So which of these dashing politicians do you think is the hottest? Take this poll and let us know!